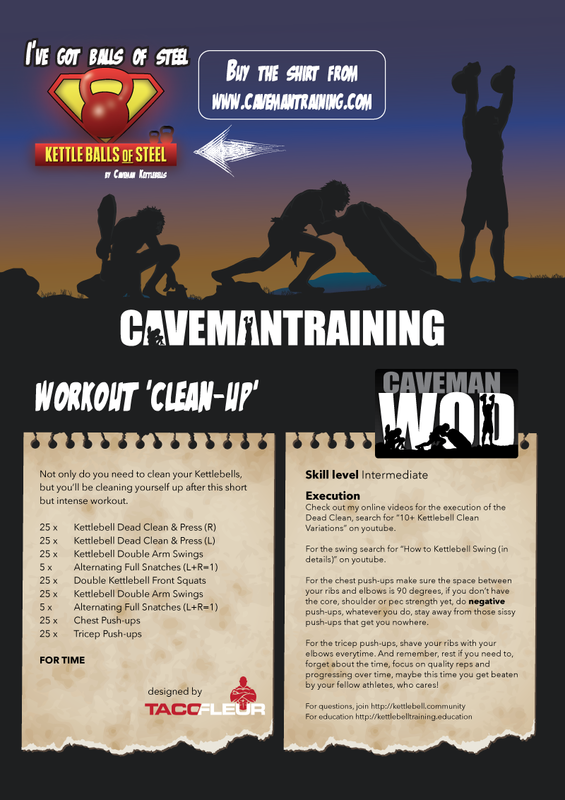 Not only do you need to clean your Kettlebells, but you’ll be cleaning yourself up after this short but intense workout. Check my time and load for this workout in the comments. Check out my online videos for the execution of the Dead Clean, search for “10+ Kettlebell Clean Variations” on youtube. For the swing search for “How to Kettlebell Swing (in details)” on youtube. For the chest push-ups make sure the space between your ribs and elbows is 90 degrees, if you don’t have the core, shoulder or pec strength yet, do negative push-ups, whatever you do, stay away from those sissy push-ups that get you nowhere. For the tricep push-ups, shave your ribs with your elbows everytime. And remember, rest if you need to, forget about the time, focus on quality reps and progressing over time, maybe this time you get beaten by your fellow athletes, who cares! I don’t have a video yet, but just ask below and I will film myself performing this workout. Serious. Just create a topic in our forum and a Caveman Trainer will provide feedback.